Walking the Camino de Santiago is the dream of many walkers, wanderers, and seekers. This movie takes you on the Camino (the Way of Saint James) with a father yanked out of his safe life when his son dies on the first leg of the journey. We follow him as he decides to finish his son's pilgrimage walk on the 500-mile trek. 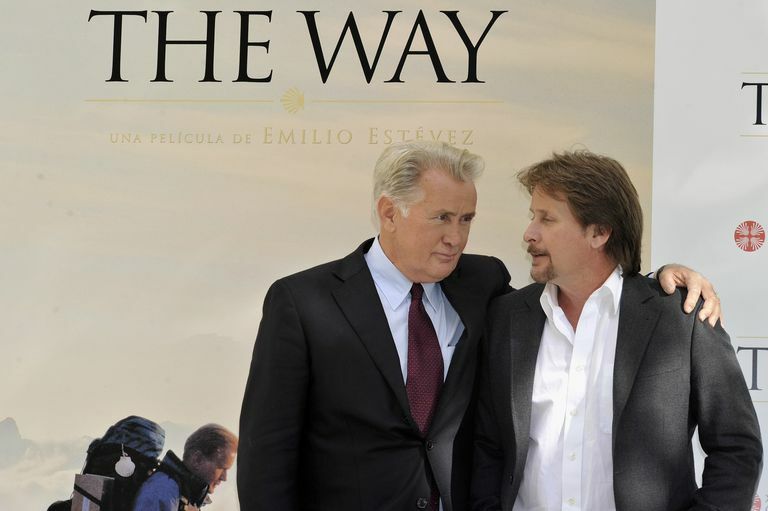 Emilio Estevez wrote and directed the movie and portrays the son while his father, Martin Sheen, stars. It's a lovely movie that combines sorrow, comedy, road trip, and travelogue. The script and acting are subtle and gentle, letting the power of the journey speak for itself. This movie is recommended for walkers of all ages. It debuted in American theaters on Oct. 7, 2011, mostly playing in smaller art houses, but it found its audience and has made a lasting impact. This film is credited with inspiring huge numbers of Americans to walk the Camino de Santiago. The popularity of the trek shot up in the years after it was made. The year it came out only 3,672 Americans were among the 183,378 pilgrims walking the Camino. By 2016, there were 15,236 American walkers among the 277,854 total for the year, with their overall percentage doubled. Martin Sheen plays Tom, a California ophthalmologist who was opposed to his son Daniel's (Emilio Estevez) decision to quit grad school and see the world. He receives the call no parent wants to hear—his son has died in a sudden snowstorm in the Pyrenees mountains of France on the first leg of the Camino de Santiago. He flies to Spain to identify the body and learns about the Camino from the police official he must deal with. He makes an impulsive decision to take up his son's journey, despite warnings that he is older and untrained. Tom keeps his grief to himself. He shows only a curmudgeonly exterior. He reluctantly accepts companionship from a Dutchman, Joost, who says he is walking the Camino to lose weight. Tom carries Daniel's ashes with him, leaving a handful here and there along the path. He also sees Daniel along the way, usually in situations where Daniel would appreciate that moment of the journey. The movie was filmed in sequence along the Camino de Santiago. Director Estevez uses the scenery as a backdrop rather than making it the star, but there are plenty of sequences of walking through the changing countryside. The cinematography was not as great could have been wished for, but it leaves many viewers with a longing to trek through those villages and across that landscape. You see the noisy sleeping dorms of the albergue guesthouses along the Camino de Santiago in northern Spain. Joost is eager to sample the local culinary delights of cheese, wine, and leg of lamb. They pick up another traveling companion, an embittered Canadian divorcee, and then an overly-emotive Irish writer trying to overcome his writer's block. These characters are well-acted and don't devolve into caricatures. While there is comedy, thankfully you can't say, "Four people hike the Camino and hilarity ensues." All of these trekking companions smoke, which is realistic for Europeans, and weed is as popular with them as tobacco. Tom keeps up a determined pace as he is on his own mission. As the writer character describes, people walk the Camino for various reasons. Physical challenge, cultural immersion, spiritual exploration, or journey to repentance—all have been reasons for people to walk the Camino for over 1000 years. There are many moments when Tom sees Daniel and only the hardest heart isn't moved, but it never feels like heavy-handed tearjerking. In the past, people walked the Camino to earn repentance for their sins. The film's traveling companions all find some of what they may have been seeking. There are no dramatic revelations and transformations. But the long walk gives you a chance to come to grips with past choices, traumas, and regrets. Martin Sheen is a devout Catholic, and Estevez's choice to make Tom a lapsed Catholic rankled him, but was the right choice. It is easier for the audience to go along on the journey with someone who isn't on a blatantly religious quest. Those who know the religious history of the Camino will appreciate all the details, while those who don't aren't hit over the head with them. Estevez got the whole crew to make a prayer of novena to become the first film crew allowed to film inside the Cathedral de Santiago. This was a necessary part of the movie, and it is great that you see the actual cathedral rather than using a stand-in church. If you have thought about walking the Camino, this movie can help in deciding whether this is the right walking journey to take. This is fiction, not a documentary, so here is a gentle critique of the points shown about walking. Tom is shown as a golf-cart using golfer, who never walks when he could drive. It's doubtful he could have made it through the first challenging days over the Pyrenees without training. Tom was using his son's gear, which seems to fit perfectly. Martin and Emilio do seem to be about the same size. Even so, it isn't recommended to wear boots you haven't worn in training. Where were the scenes of blisters and chafing? Joost was using trekking poles with correct technique. Most Camino walkers use trekking poles. There was a stream of banter about what makes it an authentic Camino experience. Don't you have to suffer? Isn't roughing it by camping or staying in a hostel dorm a necessary part of the experience? These are the sort of things walkers often debate, although pilgrims often respond that you need to "walk your own Camino." Some of the characters disputed the need for suffering. The time spent walking, no matter where you lay your head, is what can clear the way to self-discovery and open you to the world around you. Eighteen percent of those walking the Camino are over age 60. This movie is recommended for people of all ages. It's safe to view with your grandkids and your grandparents. Be sure to have tissues handy because you are likely to shed a tear. But you will also laugh out loud and you will be smiling most of the time. The only warning? That you will get the itch of wanderlust to take the journey yourself. Does the Quell Really Help Reduce Pain? How Safe Is the Camino de Santiago Pilgrimage for Female Walkers?